I have been doing some custom dyeing and have to do some more today for Annabel Rainbow in England. I should have all the pieces finished by this evening especially if the sun continues to co-operate! I am off to Tasmania to teach for the weekend- hope I can inspire some wonderful dyeing and stitching! And I keep forgetting to mention it but My Place will be seen at a new event organised by Expertise Events named the Textile Art Festival in Brisbane at the end of May- there will be lots of interesting exhibitions and a wide range of workshops are being offered. I shall be teaching on the Saturday- Transfer dyeing/printing and stitching ( working with lutradur in other words). If there is anyone in Queensland who would like to do some exhibition sitting for me on thatSaturday whilst I am teaching please email me- I need towo people- one for the morning and one for the afternoon so you will have a chance to look around the other exhibitions as well. I shall also be deomonstrating on the Friday and Sunday. I am looking forward to it! I was playing around today and eventually settled on photographing some of the sequences in creating abstractions form an original photograph. I often get asked how you do this when I teach workshops , and on the whole for me it is a lenghty process that might involve years- drawing shapes , refining them , looking for line, contour, shape and ultimately colour. It is something I have been able to do from reasonably early on as I have always felt confident in colour use- so for me often the overriding factor is how the colours balance each other and the rest sort of falls into place from there. 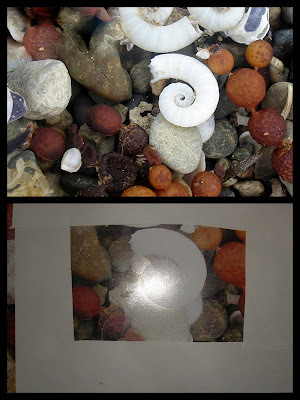 The top image is the original photo, already cropped which I took whilst beach combing in the Bay if Islands., New Zealand I particularly liked the spiral shape, because everywhere it is depicted as an unfurling fern frond, and yet here it was in a shell shape on the beach. After cropping the photo I printed it and then created a viewing rectangle from paper so I could place it on what seemd a pleasing arrangement and one which gave visual play as well as colour contrast. I then drew line drawings of the viewing window- the blue ink one first, which I don't much like, but I did like some fo the shapes, the black one second- that was much more interesting because I stopped looking at the original picture except for cursory guidance- Instead was looking for positive/negative balance and line.I could see possibilities so refined it further into a postcard shape adding texture to the ink drawing in order to create positive/ negative balance ( but I was already thinking about the stitching at this stage so the texture also had in mind the kind of stitching i might do). 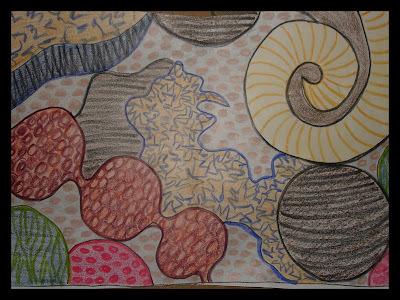 Then drawn again and coloured in- not terribly successful , but I did like the emrgence of blue into the playing area. Adding texture to the coloured drawing much as I might stitch- have completely let go of the original photograph- I am now playing in the area of poetic licence- what adds interest and what doesn't? I decide to do it in two colour ways- one with a background not too dissimilar from the colour sin the original photo, the other what I found a pleasing colour combination- I vliesofixed the cut out shapes and then stitched using the texture drawing as a rough guide- but as I was determined to try the Aurifil Rayon 12 weight threads, my palette was a little different to what I might normally l use ( I used what was sent to me). I left the turquoise coloured background till last- and that is when my machine had a teenage tantrum- so I called it a day. But what an effect stitching has and how little or much does it look like the original photo? I keep on seeing Pinocchio in the turquoise background one, even more so once it was stitched. Aurifil Threads Have Been Used! A couple of weeks ago I posted an image of threads that had been very kindly sent to me by Alex Veronelli of Aurifil threads, and the link I have provided is to the Aurifil blog. I had particularly asked for some heavier weight threads- the Rayon 12 weight and Alex also sent the heavier cotton thread in 30 weight plus some of the lana threads ( yet to use but will be doing so). As some of you know who have done classes with me , I run two threads through the top of my machine in order to get a thivcker thread line ( and yes my machine has tension hiccoughs with that, but I think my machine is a tension drama queen and if she keeps it up she will be getting traded in- first I will see what happens if a buy a new set of bobbins as those plastic bobbins tend to get misshapen from the heat of spinning). Anyway I am here to report that I love love love those twelve weight rayon threads ( yes ms drama queen machine did have a few annoying tension jumps as you can see from the close-up) but how wonderfully do these threads sit on the fabric in the quilting process?? The threads are saying look at me, aren't I gorgeous. The blue and yellow thread are the rayon and the red and variegated thread are the cotton. I really like both. So I will be finding out how I can get more colours as this is exactly the kind of thread I have been looking for. The piece is constructed from orange coloured polyester fibre ( lutradur for want of a better word or spun polyester) which a friend bought in a Toto in Paris, with hand dyed cotton laid underneath. The piece measures 35cm square and is for sale for $95 US Inclusive of postage. I have been in avoidance mode in doing my bookwork for the accountant - I am behind and it has finally gotten to the point where I can't avoid it any longer- or can i??? I needed to create some space to sort accounts, and found this smallish quilt I had made for Caravanserai which I don't think I have put on my blog before as I finished it at the eleventh hour before AQC. 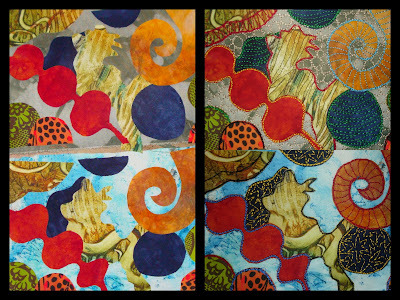 The image was transferred to fabric using a product called Inkaid which I bought at Zijdelings in the Netherlands. I have not seen this product in Australia- but I have also not been looking that hard. It creates a much nicer image on fabric than bubble jetset- though it does change the hand of the fabric. And as you can see you need to be careful in applying even coating on the fabric as uneveness does show up - in the black bit. And I made good progress on sorting the accounts ( which I had stuffed into a box- every year I resolve that I am going to be better at this and do the bookwork at the end of each month- but it never seems to happen - how do others cope with this?) and should be able to get things to the accountant by the end of the week- once I start I fi9nd it is not as hard as I thought it would be- just requires a bit of organisation! Oh and I gave myself a bonus for also sorting this years accounts whilst i was at it ( I may even end up ahead of the game) I ordered some more rayon "cheeses" in a range of colours from the Handweavers Studio in London. It is the thread I used for the cross stitches in the Palmyra piece and also the thread I have used for the travellers blanket- and you can just never have enough thread! They have over 300 shades of yarn. You could be forgiven in thinking that this blog is not about textiles at all- I seem to have shown precious little in recent times- and thoughI have been very slowly working on my travellers blanket-Blue, I don't seem to have done a single thing on the machine since the end of february- do I remember how to use the machine???? Looking at other blogs everyone seems to be so productive and I have little to show. I hand dyed this piece of fabric yesterday to sort of represent our sunburnt and drought ridden country for the climate change exhibition- in a way it seems too vibrant to me- it will have fire going through it, and the swirling motion of the darker areas does remind me of the tree limbs that were flying around our house on that horrible Saturday in February. I am still thinking about it. The print above is by an Italian artist named Ugo Barraco- it is of a quintessential Venetian scene, and I hope the artist will forgive me posting this image. Unfortunately there is very little presence of his work online so I can't give you any links, but I bought one of his prints many years ago at his little cart at Piazza san Marco in Venice. On my last visit to Venice his wife was there with his cart but all I could afford was a poster. However trawling on ebay a couple of weeks ago, I found this print and I loved it so it arrived in the post yesterday. This was my paltry effort for yesterday- stitching the wool fabric I bought- it seems static to me- I am so used to the liveliness of the hand dyed fabrics- but I do like the depth of the black colour- maybe it needs hand dyes on there rather than woollen squares. I don't know. I seem to be curiously bereft of any ideas or creative spark at the moment. I really should do something about getting my Carvanserai exhibition seen elsewhere- but I am aa bit stuck on where? There is still an icon piece I want to make for it also, but again ideas about this have deserted me. In an effort to find enthusiasm I have been reading through some of my older journals- trawling for ideas but that is not doing the trick either. I am dyeing some muslin at the moment and have ordered a whole lot more. The muslin is a much lighter and softer weight and is beautiful for hand stitching as in the Travellers blanket I am working on ( if anyone would like me to dye any let me know as I intend to do some daily dyeing for the next week or so). Then i one of my workshops I taught a couple of weeks ago someone suggested I should do a 72 Ways book of hand embellishing a la travellers blanket style- I had not thought of doing this, but the idea speaks to me , and then as most of my fabrics are hand dyed and printed how best to do this- though I suppose any fragments of fabric could be used. 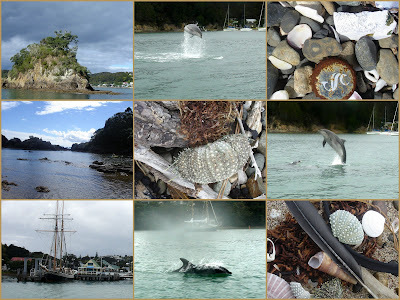 The last day at the Bay of Islands we spent sailing and looking at dolphins. I had not intended to do this, as we were on a budget , but the water looked beautiful and the thought of sailing was enticing. So what the heck we did and we are glad we did. We went with a company called Sailing & Dolphins and the catamaran was called Carino NZ and was skippered by a woman ( Yay! )We did get a bit of drizzle but we had a wonderful day and we did see dolphins! The beach paraphernalia was from the small beach at Robertson Island, which was the place where Captain Cook landed in New Zealand however the whole region had already been settled by Maori, who were great seafarers. Did quickly drop in and see a small amount of Wellington Symposium goings on and did see Katherine Morrison's wonderful, simple, powerful work at Pataka and was lucky to have afternooon tea with Clare Plug where she showed me her fantastic Antarctica photos and inspirations and her even more evocative interpretations of her experience which will be shown at the Hawkes' Bay Museum and Art Gallery in Napier in beginning in May sometime.It was a treat to see how the artist had worked with the material/inspiration which is at once so alien and yet also familiar with stories of racing for the South Pole and bravery and death.I am hoping I can see the exhibition fully installed- with not only Clare's work but educative , interpretative material as well, particularly the fragility of the environment as Clare encountered it. I also was lucky to see some of Clare Smith's new work , which I liked a lot ,some of which will be shown in the Climate Change exhibition which will be shown at Minerva Gallery, Wellington in late June. 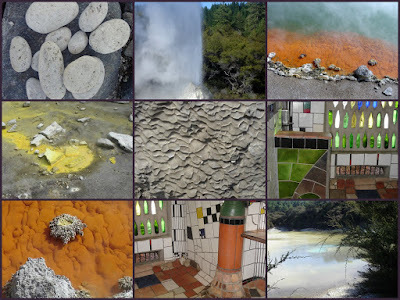 Ok and we were tourists the rest of the time.... we visited the thermal area near Waio-o-tapu where the Lady Knox geyser dutifully frothed into life after been given the soap to break surface tension to allow the pressure to shoot out the cold water- there is a about an hour and a half walk around the thermal area itself- lots of steam and rotten egg smells, some wonderful colours, particularly at the Champagne pool and some of the smaller sulphur eruptions.Then onto Bay of Islands, a quick stop at the Hundertwasser public toilets in Kawakawa ( which unfortunately were not all that well cared for, and exuded their own kind of odour) and a two day wind down which included a day boating/sailing to see dolphins. More tomorrow. Am I inspired??? yes and no- have a lot of work to do, did buy some pure wool to work with for stitching, not quite sure what that will bring on, but it demanded to be taken home. Did do a small amount of work on the travellers blanket- but when you are the driver and tourist guide for two teens with varying degrees of interest into the wonders of the physical environment you do tend to be a bit tired at the end of the day! Ok got to get dressed and go to my fathers house about an hour from here! 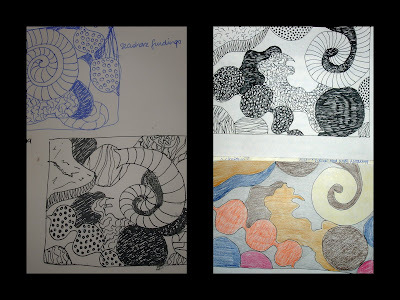 Oh and I will answer the questions about the mono-print in my next post. Some photos of mono-printing I did the other day. I finally bought a sheet of glass with which to do some mono-printing- I am just playing around really and not quite sure whether I shall even use any of these. I could have drawn shapes into these, but just wanted to see the effect of swooshing brush strokes. We had to get up early in order to get to the airport for a 7.15 am flight to New Zealand- off course we got the time kind of wrong because daylight saving also ended tonight- at least we have an extra hour hence my blog post. My Place will be shown at Minerva Gallery in Cuba Street Wellington. Am looking forward to a break in the land of the long white cloud and then getting stuck into things on my return! I am constantly amazed by what the internet brings and makes accessible, but I must admit there is also soemthing to be said for good old fashioned post. Whilst in Adelaide teaching the popst brought me a packet of Aurifil threads with which to do some experimenting- I was particularly interested in the heavier weight 12 rayons and can't wait to get going on something and see what it is like. Aurifil also sent me some colour charts and I am particularly enthused about theFilato Lano 12 thread- which is wool and acrylic thread for the machine and hand embroidery- I can see another travellers blanket coming on using this thread- there is a good colour range though I would like to see more lime/mustardy greens I can also feel another book coming on- in fact two-! Then the post brought From Kandinsky to Corneille- linoleum in the art of the twentieth century-what a wonderful selection of linocuts by many of the twentieth centuries' most well known artists as well as some lesser known ones- I am falling more and more in love with this form of printing- just have to find a press somewhere one of these days. The book covers are actually made of lino and I was able to purchase it off the Silk Cut website ( see the link above). And please look at last years silk cut printing winner here. This is all part of the research I am doing for th elino-cutting course I am devising- I really want to look at the design side of lino-printing and so have been searching for examples!